Plymouth Pride 2018 is fast approaching and will take place on Saturday 11th August. 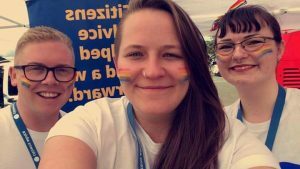 We are proud to have a presence at Plymouth Pride year on year and are passionate about the work they do in bringing people and groups together to celebrate, promote the diversity and talent that exist within the Lesbian, Gay, Bisexual and Trans (LGBT) communities in Plymouth. Citizens Advice Plymouth will have a stall on the Hoe where you can find out more about the help and advice we provide for those who live, work and study in Plymouth on a huge range of issues. Our staff are also on hand to discuss the different volunteering opportunities for those who want to help provide our much needed work in the city within an organisation that celebrates the value that diverse people bring to the community.